Food–how we eat it, how we prepare it and who we enjoy it with is a window into every culture. Yorùbá culture surrounding food is quite different than the that in the United States and everywhere else I’ve been. The Yorùbás follow a certain set of customs when eating. While they are widely practiced, they are not mandatory. Many Yorùbá people wait until after they are completely finished eating the meal to drink. Not everyone does this but most older people I have shared a table with at the cafeteria do. They will shovel down their food and chug down a Fanta or Maltina (non-alcoholic malt beverage that is extremely popular here) in a couple gulps. In order to explain why eating with your hands makes more sense than eating with a fork and knife it is necessary to understand the type of food Yorùbá people eat. A typical Yorùbá dish is something like a soft but stiff pounded porridge made from cassava or some type of yam (when I say yam yam, I don’t mean sweet potato). This porridge could be called amala, iyan, semofita, fufu, or eba. They are each pretty tasteless but each one definitely tastes and feels different. So you use this mashed potato like food to eat one of the many types of stews. This you do with your right hand, not the left. You take little bits of the porridge thing and mop up bits of soup, put it in your mouth and swallow it, chewing is not necessary. When you see Yorùbá people eating, it is almost always with their hands, unless they are eating rice. All the cafeterias have big jugs of water on the table to wash your hands with before and after the meal. 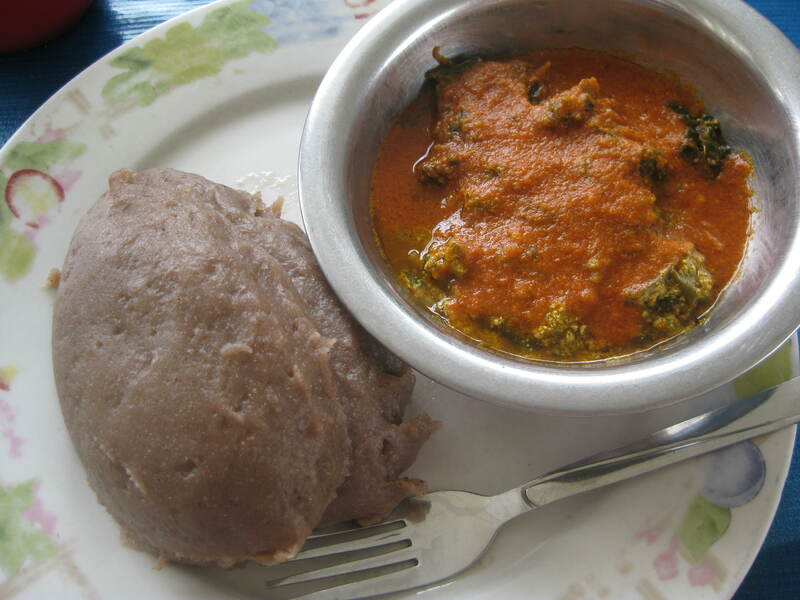 Amala (left) and Egusi with pepper soup (right). I wasn’t up to the hand challenge that day. If you do not feel like dirtying your hands, or you are not up to the challenge of eating with them, you can use a spoon. Spoon is the eating utensil of choice. Forks are rare. Eating or drinking while walking is taboo. You never see someone walking down the street munching on peanuts or peeling bananas (the most popular snacks here). Even drinking water while walking is not typical. It is considered bad manners to do this. People who were brought up well are expected to sit down when they eat. Cooking is a woman’s job in Yorùbáland. Traditionally men planted the yams and did the back breaking work while a woman’s job was to cook for her husband. It is still the same today. I have never seen a man in a kitchen here. Women are the cooks. The Yorùbá equivalent to salad is grated cabbage, carrots and cream, a.k.a cole slaw. So if someone asks you if you want salad, it will not be tomatoes, cucumbers and other veggies on a bed of lettuce, it will surely be cole slaw. The list could probably go on, and over the next 8 months I’m sure I will discover more idiosyncrasies with food culture here. These are just some of the few I’ve picked up on so far. I’m just glad I’m slowly improving on taking the right amount of stew with each scoop of amala so I run out of both at the same time.